The tale is mostly of an older fellow quietly minding his own business until a chap comes to interrupt him. That wasn’t the part that grabbed me in particular though. 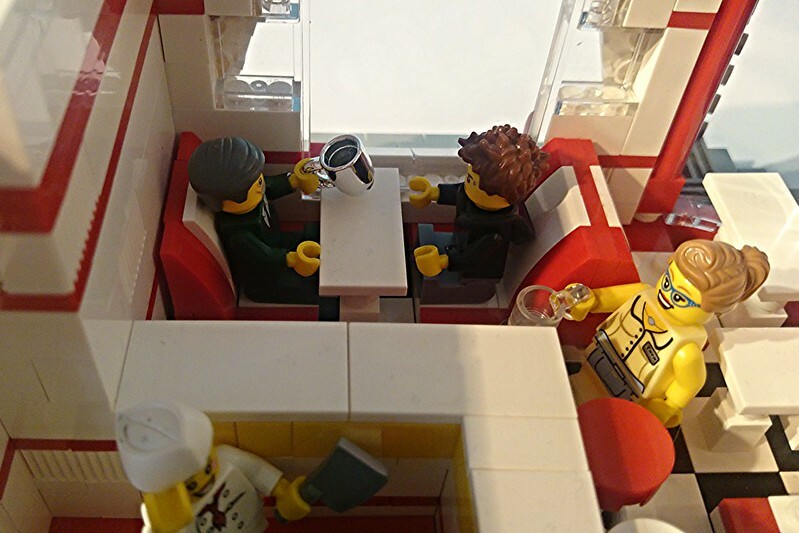 In the episode he’s in a McDonalds but I just couldn’t face constructing a vendor of such bland crap so I’ve taken a huge leap of creative licence and made a diner instead. I hope Skinner Co can forgive me. 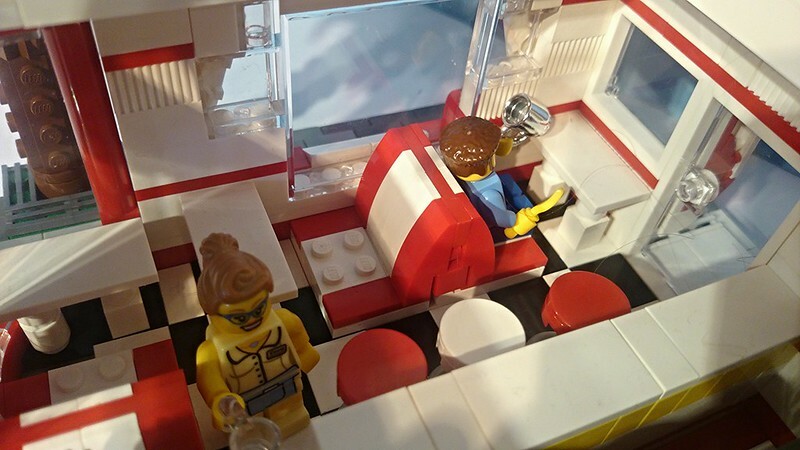 I’ve thought about making an American style diner before but lacked the narrative impetus. The two colour scheme was stuck in my head right from the start, although it took a whole series of rebuilds before I could place windows more or less consistently. I wanted just enough red to not overdo it or look slapped on. I also had a nice curving window part from a Lego Friends set that I was desperate to use. It caused me a lot of grief with the flooring. It’s come out quite prettily. I ran out of useful bricks for the roof, so it only looks right from the front corner. The trees were absolutely necessary because I’d built them for the last illustration, FP007-12 before realising I didn’t need them. No way were they coming apart without being used! 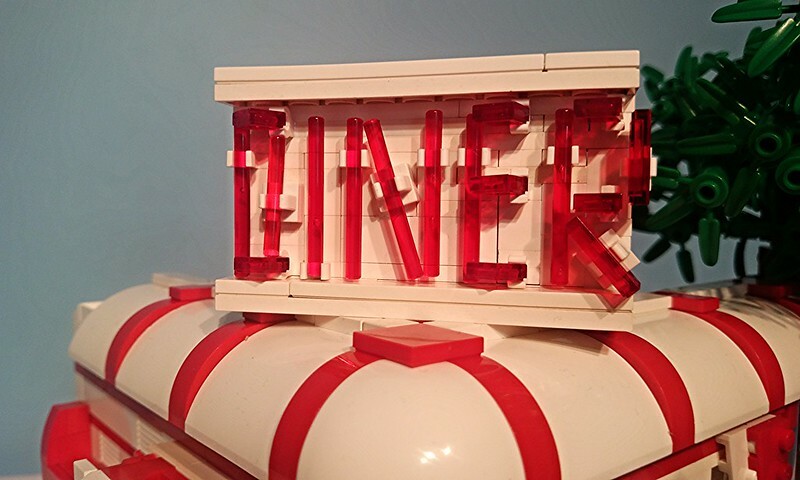 The diner sign was fun to play around with. I found it very difficult to make a compact sign using letter techniques I’ve previously used. I also wanted a sense of the neon letters glowing in the dark. I developed an awkward compromise – most of the uprights are single lightsaber bars with 1×1 and 1×2 transparent red tiles to make up the horizontals and everything else. It works really well from a certain angle! With barely a flicker of thought I’ve once more assembled a building which is almost impossible to photograph inside. Please excuse the massive shadows and aerial views. I do love a good tiled floor. 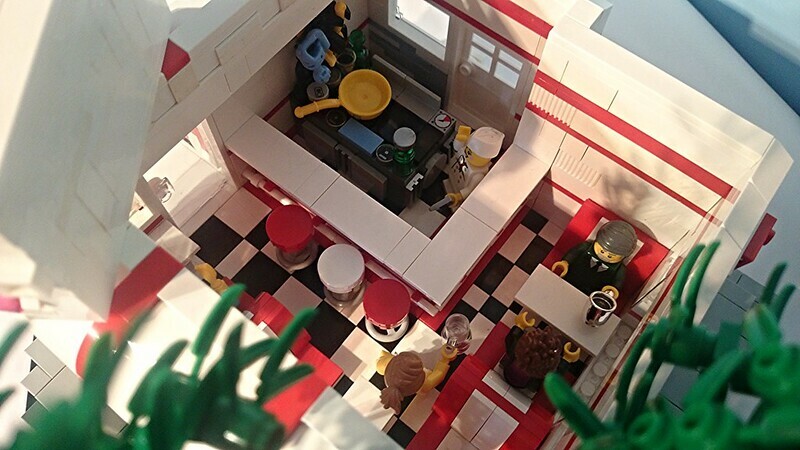 I also had plenty of red and white curved bits and tiles for making the interior as hard to look at as the outside. I’m particularly pleased with the booths, which feature a neat bit of stud reversal inside to get that double unit. 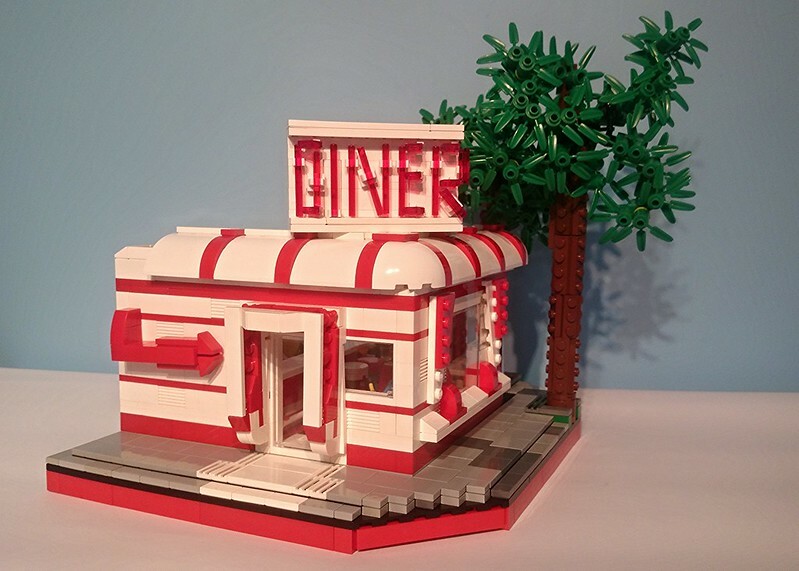 It’s a shame I didn’t manage to build the diner in a shape that shows them off. I live and forget. The stools at the bar have steering wheels as bases, I’m quite proud of that. The kitchen is very compact and has no storage. This was a very fun build and I’m glad to be signing it off here before destroying and re-sorting it all. As ever, the Flash Pulp project is pushing me in new directions and helping me find a reason to make stuff I would not have thought about before. Next Where Have All The Pighearts Gone?